After a soft early two weekends, the tests will come early and often. A Nov. 18 trip to Stanford is followed by three in a row against Michigan State, Florida State and Winthrop at the Paradise Jam in the U.S. Virgin Islands. “I like this schedule for this team,” said third-year coach Lisa Fortier, who also gets regional rivals WSU and EWU in early December. Home games during the holidays against Northwestern and Colgate set up the compressed WCC schedule, which doesn’t begin until Dec. 29 at Pepperdine. The first conference home game is Jan. 5 against San Francisco, the first of three straight at home. A big midseason test comes on Feb. 2 against BYU and two days later at San Diego. Elle Tinkle is taking it easy this year. Really. Long hours on the Gonzaga basketball court are often followed by longer ones at Sacred Heart Medical Center. She’s also taking 13 credits of upper-division classes. That’s the easy part, insists Tinkle, who’s enjoying the chance to “stretch” her senior year with a lighter load. “I’ll take that for sure,” she said with a laugh. If that doesn’t make sense, then you don’t know Elle Tinkle, a 6-foot-2 guard whose grace on the basketball court belies a get-’er-done grittiness in every phase of her life. Even when that life is turned upside down. A year ago, Tinkle had everything planned. 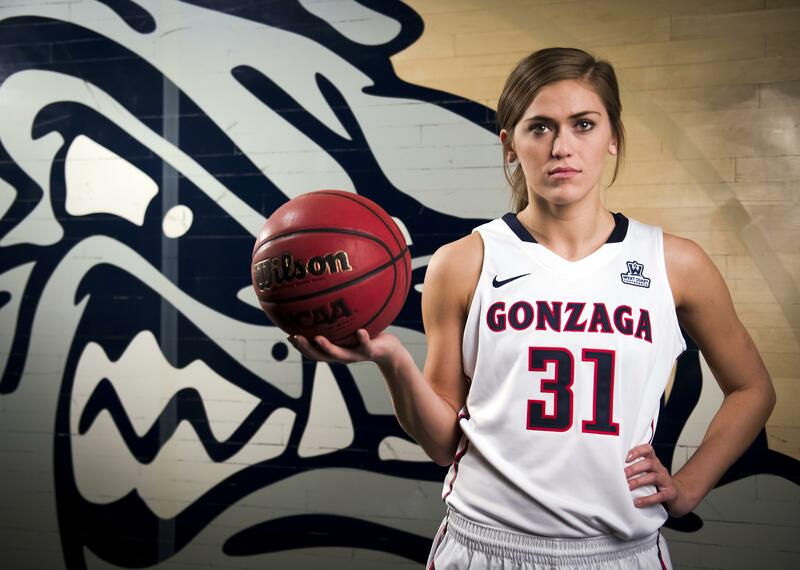 She was a preseason all-West Coast Conference selection and a major reason the Bulldogs were picked to win another West Coast Conference title and get back to the NCAA Tournament. After that, she would consider going pro or becoming a nurse. The plan fell apart quickly. A hard fall in the first game of the season turned out to be a knee injury that grew steadily worse. Meanwhile, GU also lost post Emma Wolfram for the season. The Bulldogs soldiered on, but with depleted ranks. They finished 19-14 and fifth in the WCC. Tinkle was there for every game, offering advice and encouragement, all the way to a bittersweet Senior Night. That’s when she said goodbye to the friends and teammates she’d known for four years: Shelby Cheslek, Shaniqua Nilles and Chelsea Waters. “That was special, that was a group of seniors I’d been with for four years,” Tinkle said. A few weeks later, the hardship waiver was approved by the NCAA, and Tinkle had some certainty back in her life. “I’m just glad that I get another shot, but there’s definitely going to be some déjà vu this year,” Tinkle said. Call it her super senior year. So far it’s gone quite well, thank you. Fall semester began with that “stretch” 13-credit class load. Tinkle felt the difference from those 17-credit slogs of the past. Last spring, after the season ended, Tinkle spent every weekend at Sacred Heart, working eight- and 12-hour shifts. “I try to imagine how I would have done that this year” with a bigger class load, she said. Tinkle would have managed. She was a pioneer of sorts, the first student-athlete to tackle the basketball-nursing combo. “Sometimes, I have to ask myself why I have this hectic, crazy, sometimes-unimaginable schedule, but it’s because I love the program, and my teammates,” said Tinkle, who still manages to carry a 3.46 grade-point average. “I was hardheaded. I didn’t see the purpose in choosing a major that was just going to go with my basketball schedule,” Tinkle said. Compromises were made on both sides with class and basketball commitments. “The coaching staff and the nursing faculty have been unbelievable,” Tinkle said. After she was cleared to return, Tinkle realized she’d been away from the court for so long. “It took some time to get those lungs back,” she said. Her first live action came on Oct. 15 in a public scrimmage on Fan Fest, where she looked 100 percent and ready to do whatever it takes. She and coach Lisa Fortier spent the offseason discussing Tinkle’s role in what looks like a fast-paced offense. Published: Nov. 3, 2016, 4:41 a.m.